Optimized for Nikon's compact DX-format DSLRs, the AF-S DX NIKKOR 55-200mm f/4-5.6G ED VR II features a retracting design that's small and lightweight-ideal for travel and everyday use. Its versatile zoom range goes from 55mm, which is great for portraits and group shots, up to 200mm telephoto for catching close-ups on the sports field, school events and more. Forget about blurry photos and shaky videos; Vibration Reduction (VR) helps keep your photos sharp and your videos steady. 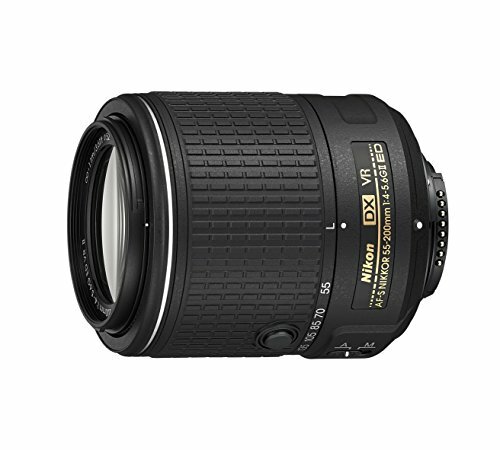 On its own, the AF-S DX NIKKOR 55-200mm f/4-5.6G ED VR II is a great multipurpose lens. As a companion to the 18-55mm kit lens that comes with many DX-format DSLRs, it offers continuous coverage across the entire focal length range from 18mm to 200mm.FEATURES: Small, lightweight telephoto zoom lens - Thanks to a new retractable lens barrel design, the AF-S DX NIKKOR 55-200mm f/4-5.6G ED VR II is remarkably small and lightweight, making it a well-balanced match to Nikon DX-format DSLRs. Zoomed out, it's just 83mm long, approximately 20% shorter than previous models. Zoomed in, it provides 200mm of telephoto reach to get you closer to all the shots that matter.Vibrant, clear photos and videos - The AF-S DX NIKKOR 55-200mm f/4-5.6G ED VR II is an advanced lens that pushes Nikon's new high-resolution DSLRs to peak performance. Super Integrated Coating (SIC) delivers superior color quality while reducing ghosting and lens flare. Extra-low Dispersion (ED) glass nearly eliminates optical distortion, while a rounded seven-blade diaphragm makes out of focus elements look more natural.Nikon Vibration Reduction (VR) technology - Forget about blurry photos and shaky videos with the AF-S DX NIKKOR 55-200mm f/4-5.6G ED VR II. Nikon Vibration Reduction (VR) image stabilization provides 4.0 stops of blur free handheld shooting, assuring dramatically sharper still images, steadier HD videos and enhanced low-light performance.